No more trial and error, take control of your destiny as an entrepreneur! The Entrepreneur Success Map program was developed just for YOU - so that your unique brilliance will shine in your business. You are too important, and your business is too important, for you to settle for anything less than a truly customized map for your success. 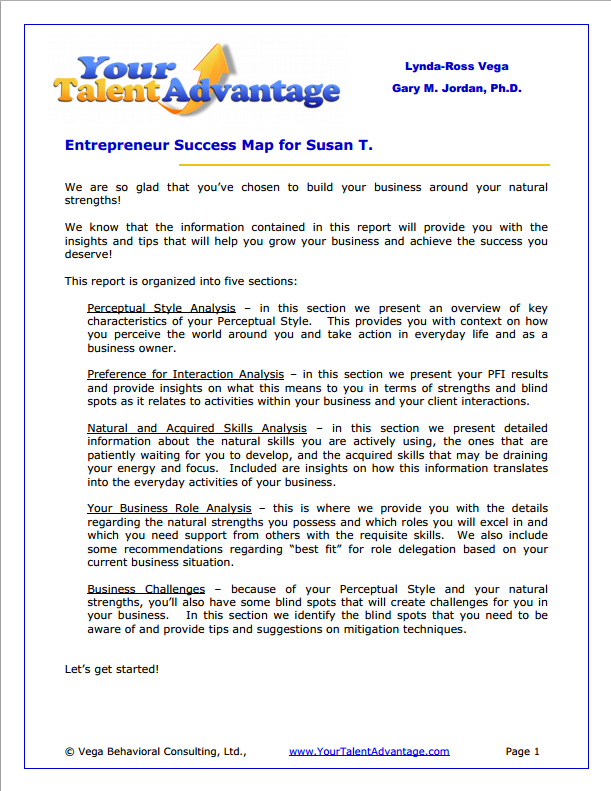 The Your Talent Advantage Entrepreneur Success Map program is a combination of laser focused coaching and our truly unique assessments - the Perceptual Style Assessment and and the Recognized Strengths Profile Assessment. The RSP (as we call it for short) builds on your Perceptual Style Assessment results and identifies point-in-time natural skills you are actually using and those that are just waiting for you to tap into (EVERYONE has strengths they are overlooking or taking for granted). The RSP also shows you where you may be overly focused on acquiring skills that wear you out. A 40 minute session to review and discuss the Entrepreneur Success Map that will be prepared just for you, based on your assessment results and your first three coaching sessions. No other business development program can provide you with the long lasting results you'll receive with your Entrepreneur Success Map! The Your Talent Advantage Entrepreneur Success Map program is yours for $497. This one of a kind program to help you uncover the keys to YOUR successful business success is one of the best investments you can make for your business and it's only $497. The Perceptual Style Assessment and 45 page Celebrate You action guide, customized to YOUR Perceptual Style, packed with information about your core strengths in 12 key areas of your life and a 20 minute results session (a $97 value). The Recognized Strengths Profile Assessment and Live Your Talents action guide filled with details about your natural and acquired skills, the roles you naturally prefer and an easy to use 5 step process to fully claim your natural skills and apply them in your personal and work life with a 40 minute results session (a $197 value). Two one-on-one 40 minute coaching sessions (a $550 value). Your Entrepreneur Success Map created just for YOU with the details you need to build your business success around your natural strengths (priceless!). Build your business around your natural strengths and achieve the success you've dreamed of! Order Your Entrepreneur Success Map program today! Let the magic in your businesss happen for you.